Golvatinib is an orally bioavailable dual kinase inhibitor of c-Met (hepatocyte growth factor receptor) and VEGFR-2 (vascular endothelial growth factor receptor-2) tyrosinekinases with potential antineoplastic activity. c-Met/VEGFR kinase inhibitor E7050 binds to and inhibits the activities of both c-Met and VEGFR-2, which may inhibit tumor cell growth and survival of tumor cells that overexpress these receptor tyrosine kinases. c-Met and VEGFR-2 are upregulated in a variety of tumor cell types and play important roles in tumor cell growth, migration and angiogenesis. Golvatinib has been investigated for the treatment of Platinum-Resistant Squamous Cell Carcinoma of the Head and Neck. The present invention, hepatocyte growth factor receptor (Hepatocyte growth factor receptor; hereinafter, abbreviated as “HGFR”) inhibitory action, antitumor action, anti-tumor agents with such angiogenesis inhibitory activity and cancer metastasis inhibitory action, a cancer metastasis suppressing the method for producing a useful phenoxy pyridine derivatives as agents. 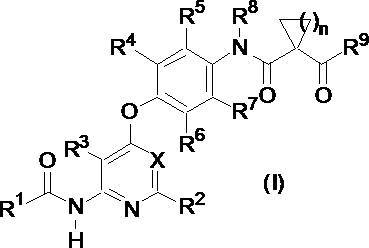 Patent Document 1 has a HGFR inhibitory activity, anti-tumor agents, useful phenoxy pyridine derivative as an angiogenesis inhibitor or cancer metastasis inhibitor has been disclosed. 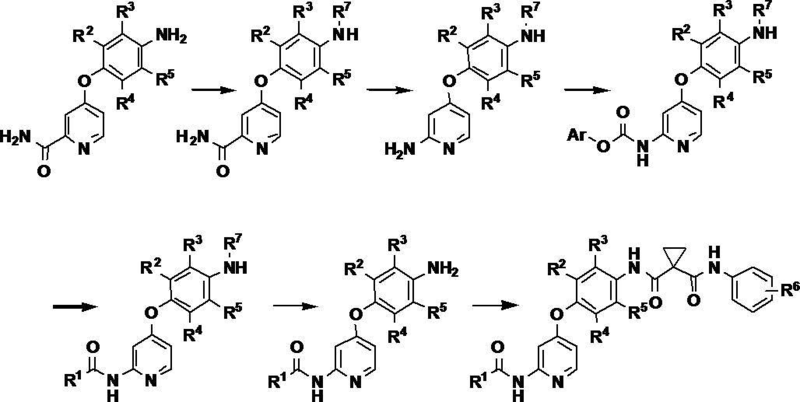 As a method for producing the phenoxy pyridine derivative, to the Example 48 of Patent Document 1, N, N-dimethylformamide, triethylamine and benzotriazol-1-yloxytris (dimethylamino) or lower in the presence of a phosphonium hexafluorophosphate discloses that perform the reaction. Patent Document 2, as a manufacturing method suitable for industrial mass synthesis of the phenoxy pyridine derivative in the presence a condensing agent, production method of reacting an aniline derivative with a carboxylic acid derivative. Patent Document 3, another manufacturing method of the phenoxy pyridine derivative, there is disclosed the manufacturing method shown in the following scheme. 17] 4- (4-methylpiperazin-1-yl) piperidine-1-carboxylic acid [4- ( To a solution of N, N-dimethylformamide (1 ml) of 4-amino-3-fluorophenoxy) pyridin-2-yl] amide (100 mg) and 1- (4-fluorophenylcarbamoyl) cyclopropanecarboxylic acid (78 mg) Triethylamine (71 mg) and O- (7-Azabenzotriazol-1-yl) -N, N, N ‘, N’- tetramethyluronium hexafluorophosphate (HATU) (222 mg) were added and stirred at room temperature for 21 hours. A 1 N sodium hydroxide aqueous solution (2 ml) was added to the reaction solution, and the mixture was extracted with ethyl acetate (15 ml). After separation, the organic layer was washed with 5% brine, dried over anhydrous magnesium sulfate, and the solvent was distilled off to obtain a residue. The residue was dissolved in ethyl acetate (3 ml) and extracted with 2 N hydrochloric acid (3 ml × 1, 2 ml × 1). The aqueous layer was rendered alkaline with 5 N aqueous sodium hydroxide solution (5.5 ml). After extraction with ethyl acetate and drying over anhydrous magnesium sulfate, the solvent was distilled off to give the title compound (87 mg). 1 H-NMR Spectrum (DMSO-d 6) .Delta. (Ppm): 1.22-1.33 (2H, m), 1.54-1.63 (4H, m), 1.68-1.78 (2H, m), 2.12 (3H , S), 2.12-2.40 (5H, m), 2.40-2.60 (4H, m), 2.68-2.78 (2H, m), 4.06-4.14 (2H, t, J = 8 Hz), 7.22 (2H, m), 6.60 (1H, dd, J = 2.4 Hz, 5.6 Hz), 7.00 (1 H, dd, J = 2.4 Hz, 11.2 Hz), 7.40 (1 H, s), 7.61 (2 H, dd, J = 5.2 Hz, 8 Hz), 7.93 J = 8.8 Hz), 8.13 (1 H, d, J = 5.6 Hz), 9.21 (1 H, s), 9.90 (1 H, brs), 10.55 (1 H, brs).